Today was one of those foggy SF days that turns into a chilly SF night. I walked home from work over an hour ago and still feel the biting cold gnawing at my feeble bones. It's times like these that I rely on old faithful to knock off the chill and warm me from the inside out. And by old faithful, I mean a concoction that I just learned how to make about six months ago. Yes, I'm still new to the hot toddy game but I know I'll never be disappointed especially when I can make it myself. This is the recipe that my friend passed on to me. Use it, change it, share it, love it. Bring your water to a boil. Coat the bottom of your mug with honey and drop in the cinnamon stick. Pour in the shots, squeeze the lemon quarter, and place the teabag in the cup. Add the boiling water, stir, and steep the tea for about 1-2 minutes. Enjoy! 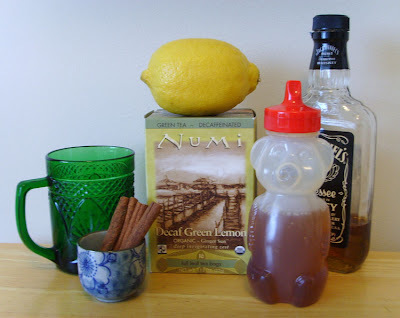 You can add in more honey, lemon, or whiskey/brandy to your liking. *I've found that just about any citrus-flavored tea does the trick. My favorites are Bigelow's I Love Lemon, Bigelow's Orange & Spice, Yogi's Lemon Ginger, Numi's Decaf Green Lemon (pictured), and Good Earth's Decaf Green Tea with Lemongrass. And I'm partial to herbal and green teas but if you're ready for black tea, then have at it. Just so you know, I'm only on sip number three and I can already feel my fingertips coming back to life.